I figured it’s been a while since I hosted a giveaway contest here at Modest Money. In the past I would give away cash or physical prizes like iPads. That stuff is cool and all, but it doesn’t really seem to fit in with a personal finance blog. Sure the cash might help your finances, but for a lot of people a windfall like that is going to be spent on something unnecessary instead. So as a more responsible giveaway I’m giving away extremely helpful financial knowledge. It might not be as flashy as cash or electronics, but it’s going to help you a lot more. 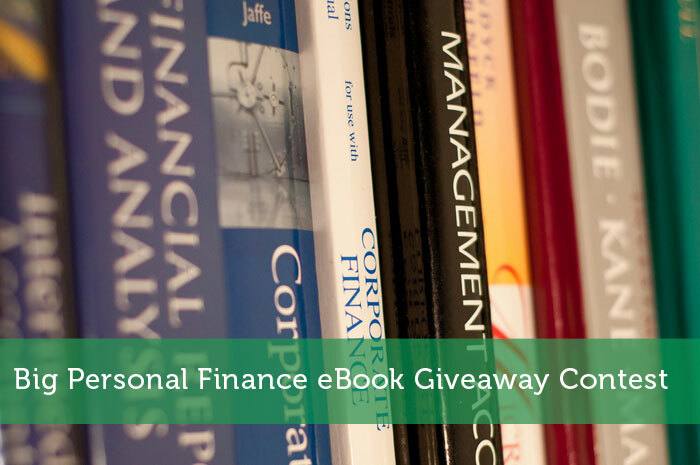 With this giveaway I rounded up 10 personal finance bloggers who have published books. That way you can get solid advice instead of just reading about my mistakes. Up for grabs is 2 ebook copies of each blogger’s book. So with 20 total winners your odds should be pretty good. Quite the impressive list of books. Even if you won’t win any of them, I suggest you consider purchasing them. I love a good ebook give away. I plan to enter early and to enter often – just like I vote. Thanks for the opportunity. These are all great giveaways! I’m sure whoever the winner would be very lucky! I just read “Train Your Way to Financial Fitness” from Shannon at Financially Blonde and I can attest that it’s a great book! I came here to say that my Ebook is awesome! It really is great if you’re interested in getting started with investing. Good luck for those entering and thanks go to Jeremy for hosting such an awesome giveaway! !